Published on May 15, 2018 in Allenatori, Generale, Giovani, Mental coaching and Stress. 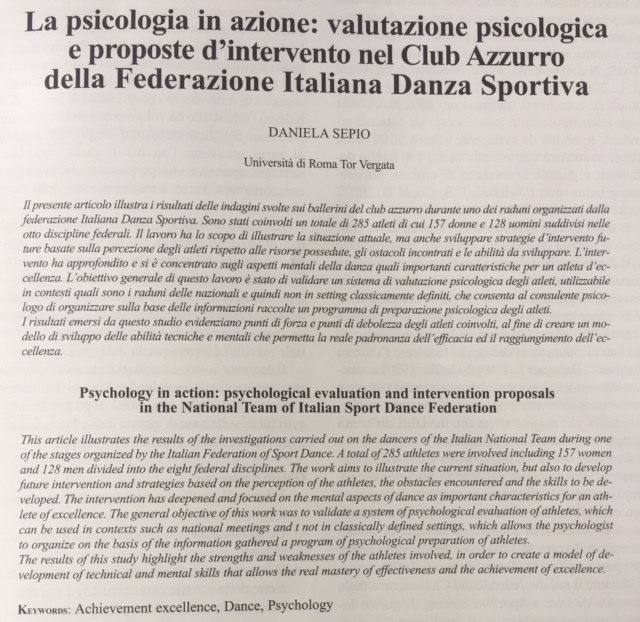 0 Comments Tags: consulenza, Daniela Sepio, danza sportiva, nazionale, valutazione. Published on April 21, 2015 in Allenatori, Giovani, Mental coaching and Stress. 0 Comments Tags: arbitri, danza, gare, giudici, sportiva, valutazione. An estimation is based on a simple psychological rule, the human being is able to give an objective and exact evaluation of a certain subject. A lot of different opinions were given about the problems of objectivity and subjectivity of measurement and evaluation. We are all very sure that objectivity of judging is quite hard to reach. The more the subject is general and not well defined, the harder is the objective evaluation. In such cases the estimation is quite subjective. A process of judging is always under the estimators attitudes’ influence. The judges’ function, in addition to being sensitive to the undeniable psychological aspects involved, it’s even more difficult than that of athletes and coaches. Not enough to know perfectly the discipline, technical aspects and rules, you must know how to apply and recognize everything promptly and accurately. psychological tension, the complexity of the race and the position of the Competition Judge: the place where the event occurs, or to assess the length of time of the valuation (also exceed 10 consecutive hours). All this can be addressed and managed through adequate training route which also includes mental training. Published on March 12, 2014 in Generale, Mental coaching, Stress and Tennis. 0 Comments Tags: concentrazione, servizio, Tennis, valutazione. When the ball went into the net or goes out, the error is obviously technical. So you say you ‘d have to hit it the ball in another way or the arm rather than your legs did not do the job right … all this is true but do not forget that the body does not move by itself is ‘THE MIND THAT LEADS, TELLING WHAT YOU HAVE TO DO. The error is always technical, but you should always ask yourself, ” How important is the mental component in this mistake I made in the serve?” And then you have to know how to reduce the error percentage, certainly the first answer that comes to say is: ”I need to improve my technique. To improve the mental approach to the serve you have to be aware of what are the psychological pitfalls that you fall down when you run this fundamental. To this end, I propose to answer a questionnaire in which you are asked how often you make mistakes more related on your mental attitude. No matter about your current technical limitations in the game you have to serve proving the quality of your action as well as now you possess, without being affected by the mental condition of the match- moment. If you use a mental approach also correct your technique will benefit from it and you can play in a more satisfactory way. Instructions: Please read each statement and indicate how often you behave in situations as outlined below with an X marking the number that best indicates what is true for you. The quality of my serve during the match and training is the same. When I serve I am not focused? Published on July 23, 2013 in Giovani, Mental coaching and Stress. 0 Comments Tags: atleta, autostima, misura, valutazione. How are self-confident as athlete? Instructions for the assessment. Read each sentence and give an assessment from 5 to 10. First, fill the column “How do I assess myself.” Second, fill the other one “What level I want to achieve.” Meaning of the score: 5=insufficient skill, 6=nearly sufficient skill, 7=sufficient skill and errors caused by stress during competition, 8=good skill during the majority of the competing situations, 9=skill at the optimal level, 10=excellent skill. Interpretation of the final score. If you have a score between 50-60 means that you think to be an athlete of medium level, you are able to show your skills in most of the not very stressful situation, increasing the mistakes when the pressures become higher. Score below at 46 shows a reduced self-confidence as athlete and at the contrary superior at 83 an high level of self-esteem as athlete. If there is a significant discrepancy between how you assess yourself at this moment and how you want to be, you will find benefit to be involved in a program of mental coaching.